This book aims to provide and challenge coaches and rowers with best practice, advice, principles and training programmes to improve their rowing experience and performance. Regardless of whether you are looking to improve on-water performance, set an indoor rowing personal best or enhance the quality of your training you will find something of value within these pages. Topics covered include: training and technique; egrometer training; specific rowing conditioning; strength training; monitoring and assessing land training; mobility and flexibility; weighlifting technique; trunk training; nutrition and mental skills. 'With the approaches detailed in this book, were were able to break records on the water and on the rowing machine and face our Olympic final feeling totally prepared and genuinely excited about the challenge. Regardless of your starting point, the guidance in this book will help you take the next steps towards your own goal, and to making your own magic. Good luck!' Dr Katherine Grainger CBE and Anna Watkins MBE. Aimed at coaches and rowers at all levels of the sport. Fully illustrated with 90 colour photographs. 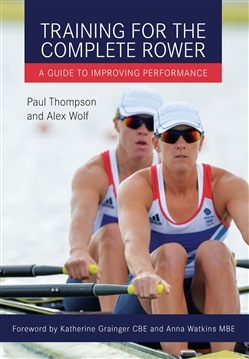 Acquista Training for the Complete Rower in Epub: dopo aver letto l’ebook Training for the Complete Rower di Paul Thompson, Wolf Alex ti invitiamo a lasciarci una Recensione qui sotto: sarà utile agli utenti che non abbiano ancora letto questo libro e che vogliano avere delle opinioni altrui. L’opinione su di un libro è molto soggettiva e per questo leggere eventuali recensioni negative non ci dovrà frenare dall’acquisto, anzi dovrà spingerci ad acquistare il libro in fretta per poter dire la nostra ed eventualmente smentire quanto commentato da altri, contribuendo ad arricchire più possibile i commenti e dare sempre più spunti di confronto al pubblico online.